One year ago on January 2, 2014, Focus on the Family made a giant leap of faith to keep Adventures in Odyssey going for current and future generations. 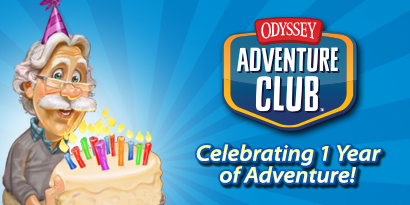 They launched the Odyssey Adventure Club, a monthly subscription which provides unlimited streaming access to nearly 800 Adventures in Odyssey episodes. In addition, members get to hear exclusive monthly episodes, receive a monthly subscription to Adventures in Odyssey Clubhouse, and other perks. And now, one year later, the Odyssey team has successfully concluded Season 1 of a promising adventure for their listeners. 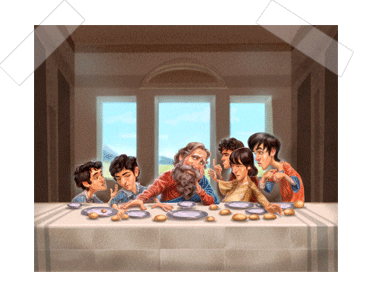 Season 2 has begun today with Follow Me, a Kids Radio adventure which imagines a possible story that could have taken place during Jesus’ day. The January Odyssey Adventure Club exclusive episode also includes a bonus “Time to Celebrate” documentary which chronicles much of what happened last year in the club, plus additional behind-the-scenes footage. Pictured above, Diane Ingolia sneaks in to the scene to cut the OAC birthday cake as OAC Producer Bob Smithouser talks to the fans. 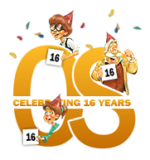 We here at The Odyssey Scoop would like to wish the Odyssey team a big congratulations on their milestone and thank them for their daring move last January to back Adventures in Odyssey in the future. We’re also excited to see what’s in store in the days ahead, especially since the club hasn’t opened up for other countries yet. Perhaps it will this year? Imagine what could happen if OAC was opened up for the entire world to enjoy! In celebration of the first birthday of OAC, new members will receive a free download of “The Last Chance Detectives” audio dramas and an autographed Odyssey poster from the team. If you aren’t a member yet, use coupon code BIRTHDAY to receive your first month’s membership for $5 and receive these awesome offers. To learn more about the Odyssey Adventure Club, visit OAClub.org.